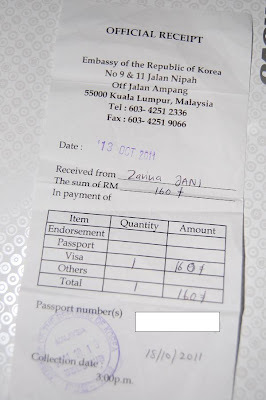 Finally, collected my visa from Korean Embassy in Ampang today. I wish there's no processing fee like Japanese embassy but if this what it takes to study Korean, so be it. Nothing is free in life anyway. 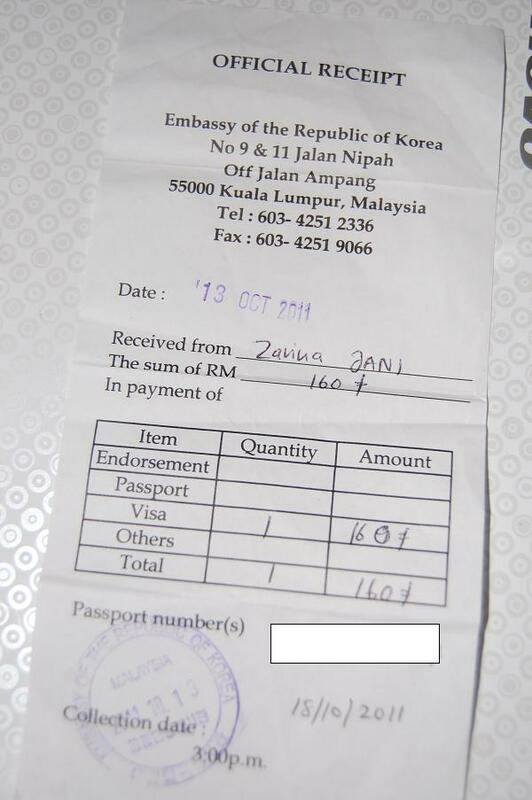 For Malaysians, you will need no visa to South Korea if you stay less than 90 days. Just enter as tourist. However, I need one as I will enter Korea more than 90 days, as a student and visa is needed to apply for Alien Registration Card (ARC). The consulate for visa processing is opened between 8.30am to 11.30 am. Last week, I went at 8.00am as the embassy's website stated the opening time is from 8.00am to 12 noon but the notification in front of the guard's post said differently. I wish I had called in before I came. As I will resign from my job once I depart to Korea, the embassy needs an additional document - proof of resignation letter from my employer. Once you have submitted the documents, you will be issued an official receipt with the date when you can collect your visa. My advice: Bottom line, call in the embassy to check what documents you need to bring before you go as different documents are needed for different type of visas. Make sure that you have ample amount in your account if you're not sponsored ie. scholarship. The more money in your account is better as visa officer will definitely scrutinize your financial situation in detail just to make sure that you aren't entering Korea for illegal work and stuff.